In these lessons, we will look at Hyperbolic Functions, Hyperbolic Identities, Derivatives of Hyperbolic Functions and Derivatives of Inverse Hyperbolic Functions and how to evaluate them. We will look at the graphs of some Hyperbolic Functions and the proofs of some of the Hyperbolic Identities. 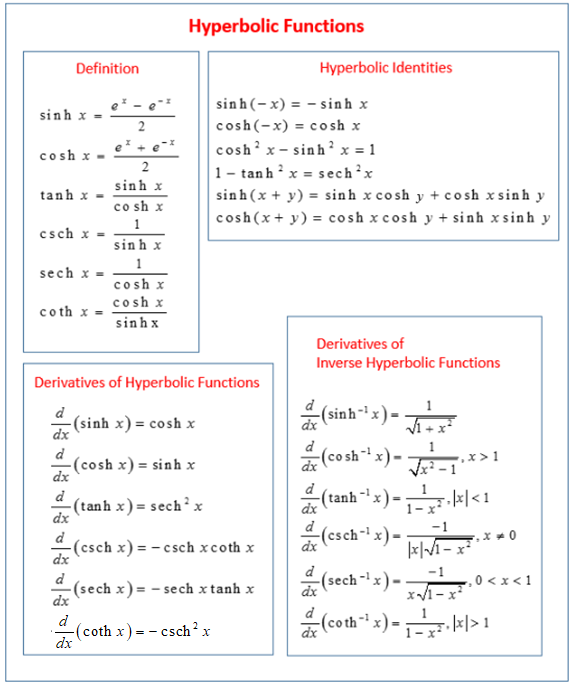 The following tables give the Definition of the Hyperbolic Function, Hyperbolic Identities, Derivatives of Hyperbolic Functions and Derivatives of Inverse Hyperbolic Functions. Scroll down the page for more examples and solutions. Using the table above and the Chain Rule. and justify a couple of identities: cosh x + sinh x = ex, sinh(2x) = 2sinh x cosh x, sinh(2) = 2sinh x cosh x. This video provides a basic overview of hyperbolic function. The lesson defines the hyperbolic functions, shows the graphs of the hyperbolic functions, and gives the properties of hyperbolic functions. Hyperbolic functions are exponential functions that share similar properties to trigonometric functions. The point (cos(t), sin(t)) is on the unit circle x2 + y2 = 1. The point (cosh(t), sinh(t)) is on the hyperbola x2 - y2 = 1. Graphs of hyperbolic functions: f(x) = sinh(x), f(x) = csch(x), f(x) = cosh(x), f(x) = sech(x), f(x) = tanh(x), f(x) = coth(x). The catenary is the curve formed by a hanging cable or chain under its own weight when supported only at its ends. This video shows the formulas for the derivatives of the hyperbolic functions and finds a few derivatives. This video gives the formulas for the derivatives on the inverse hyperbolic functions and does 3 examples of finding derivatives. This video shows a proof of one of the properties of hyperbolic functions.